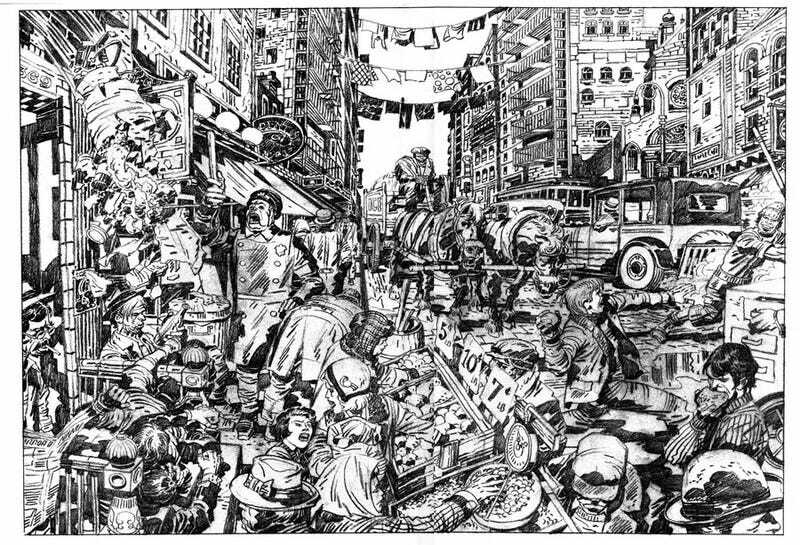 This Kirby tribute to life in the tenements can by found in Mark Evanier’s book, Kirby, king of the Comics. Today would have been Jack Kirby’s 100th birthday, so it might be an apt moment to dust off your favourite copies of the Fantastic Four, Thor, Newsboy Legion, Fourth World, Kamandi, OMAC, Captain Victory, Eternals or even Silver Star. It’s hard to measure Kirby’s influence on American comics and animation. It dominates everything, which may be a trap that the industry needs to escape. Many modern creators have built careers on emulating the dynamic style that made Marvel or reinvigorated DC. In his time, Kirby set trends or built upon them, Romance, Westerns, Crime, High Fantasy, Science Fiction, and Adventure. Even Satire. I’m sure something is missing from that list. Marvel zombie that I am, I’ve been buying the True Believers reprints that Marvel have issued this month. Nothing I haven’t seen before, all material I’m happy to see again, but the Captain America issue makes a nice contract between the developing Kirby style. It reprints Cap’s origin from the Forties then Kirby’s redrawn version from a Sixties Tales of Suspense. It put me in mind that Kirby was often twitchy about what inkers did with his pencils. Heretic that I am, I rather enjoy those team ups with Syd Shores, Vinnie Colletta, John Verpoorten, Steve Ditko, Bill Everett and Paul Reinman. Mike Royer and Greg Theakston always lacked character to my mind. The issue also includes a Forties tale where a stage magician predicts doom and disasters for the USA - acts of sabotage which then come true. Of course, the predictions are fake and Nazi agents are carrying out attacks as if it is preordained. this story was also redrawn for Tales of Suspense but unfortunately the later version is not included. It made me wonder what Kirby thought of colourists? I really need a third page for this, to illustrate my point, but unfortunately I don’t have a copy to hand. The Tales of Suspense version of the Among Us, Wreckers Dwell! story was recoloured for the World Distributors Avengers Annual 1975. Whoever did it gave the strip an almost photographic dimension and vigour that adds extra fizz. It puts many recent computerised re-colourings to shame. Can’t stress that enough. Check it out if you can find a copy. The book also features the two Steve Englehart scripted Avengers issues where Magneto had Earth’s Mightiest Heroes and the X-Men in a malevolent magnetic thrall. Anyway, raise a glass, read a copy of The Mighty Thor, enjoy yourself and share your favourite Kirby creation below.